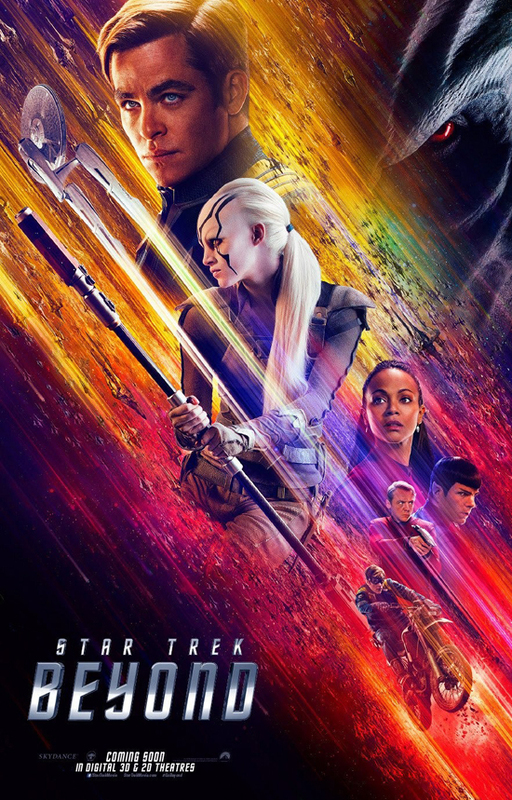 Pittsburgh Underground: Movies That Have Everything: Star Trek Beyond STARTS TODAY! Greetings all you ghouls and fools to www.PUzine.com! Our motto here at good ol' PU is that if it's Underground and in Pittsburgh - WE DIG IT!!! Check back periodically for new articles, links, artwork, and more for all things in the Pittsburgh Underground! You can follow us on our Official Facebook Page, Dead Zed Zombie Twitter Page, and PU Youtube Channel as well and don't forget to Like Us, Subscribe, and shoot us the occasional email at PU@PUzine.com or comment - we always love to hear from our minions! Movies That Have Everything: Star Trek Beyond STARTS TODAY! The entire gang is back - Chris Pine (James T. Kirk), local actor Zachary Quinto (Commander Spock), Karl Urban (Dr. ‘Bones’ McCoy), Zoe Sladana (Lt. Uhura), Simon Peg (Montgomery “Scotty’ Scott), John Cho (Sulu), and the late Anton Yelchin (Chekov) who sadly died in a freak auto accident last month. It has been a bit of a bitter sweet celebration, not only with the loss of Anton Yelchin, but also with the passing of Leonard Nimoy who left us at the beginning of the Beyond’s filming. In a recent interview with Postmedia Network, J.J. Abrams said that Yelchin’s Chekov would not be replaced by another actor. “I can’t possibly imagine that and I think Anton deserves better”. 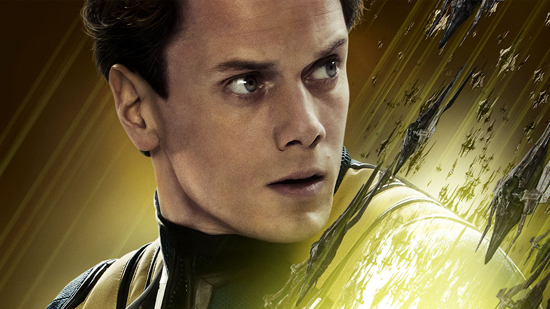 There has been no word on how he’ll go about addressing Yelchin’s death within the films. 27 year old Yelchin died on June 19th within one minute of a freak accident involving his 2015 Jeep Grand Cherokee (part of a massive recall) after it rolled down the steep driveway in his L.A. home. He was found pressed in between his brick mailbox and security fence only to be discovered by friends who grew worried about him when he didn’t show up for a planned rehearsal. In other news, Sulu, played by John Cho, will reveal his on screen character as a gay man in this newest incarnation of the Trek timeline or as it’s now ‘officially’ been named the Kelvin Timeline (named after the U.S.S. Kelvin - the starship piloted by the father of James Kirk, George Kirk (portrayed by Chris Hemsworth). Some have lauded the new spin on Sulu, and others, most notably George Takei (the original Sulu) has had mixed feelings, first stating to the Hollywood Reporter that he was ‘disappointed’, but then explaining his reaction in a lengthy Facebook post stating that he is "delighted" that the LGBTQ community will be represented in the Star Trek universe, further adding to the franchise's diversity. His mixed feelings about the decision began as John Cho who plays Sulu in the latest version of the franchise called Takei to gauge his reaction stating that, “this is to honor you”. Takei, who came out as gay in 2005, stated that when the original show was on the air in the '60s, he and show creator Gene Roddenberry, with whom he had a close friendship, had discussed the possibility of introducing a gay character. Roddenberry ultimately decided against it, fearing the inclusion of a gay character on the already progressive show (Star Trek famously featured the first televised interracial kiss) would destroy ratings beyond repair. Takei then told John Cho, 'Well I'm very flattered, I'm really delighted that the issue of LGBT is being finally addressed on Stark Trek, but because I respect and admire Gene as a bold and strong producer of television shows and I love him as a friend, I want to honor him." Takei had suggested to the director that they introduce a new character into the franchise. Ultimately, the decision was made with Takei humbly stating, “Ultimately, We should be honoring Gene ... We should be paying tribute to him rather than to me because it's not really about me. Yes I am gay, and I am an active advocate for LGBT equality, but don't pay tribute to me. It's not about me, or Sulu. It's about Gene and what he did." 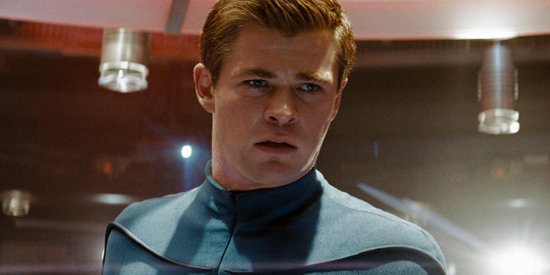 And finally, more on the next installment of the Star Trek motion picture franchise as the yet to be titled fourth film will reunite Chris Hemsworth and Chris Pine as father and son. Although Chris Hemsworth’s character, George Kirk, sacrifices himself at the beginning of the second movie, Star Trek: Into Darkness, we will see the two cross paths in a yet to be determined plot line. Whew! That’s a whole lot of Trekin’! For more, check out your local theater this weekend as Star Trek Beyond soars into theaters! Subscribe to the PU Feed!!! All Contents © 2010-18 Pittsburgh Underground Inc. / Hot Toddy Hagerich; All Rights Reserved. Powered by Blogger.